This past week, I passed the time reading. And reading. And reading. I love to read, but even I can find it somewhat tedious if it’s something I feel I have to do. I may have referenced the stack of magazines I had hidden (shamefully) under my bed. Well, the photo above was it. 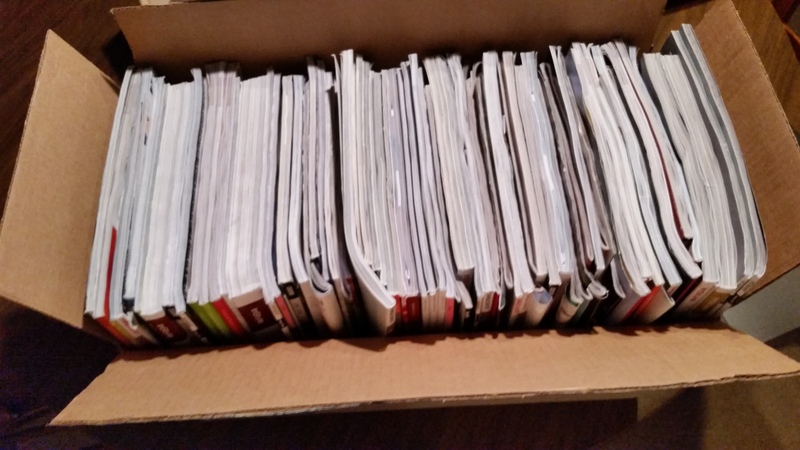 I was able to fit them all into a box that measured 14″ x 27″. And it is out of the house! And I feel good! Each and every one of those magazines was a weight on my shoulders. Maybe it’s something about my frugality, but each of those magazines was paid for, so I felt like they needed to be read. Just like throwing away good food that’s gone bad makes me feel so wasteful, the same goes for magazines. Anyway, I carried this tremendously heavy box into the library the other day and the librarians took one look at me, sighed and rolled their collective eyes. a. I like to feel I’m giving to the greater civic good by donating them to the library, thereby allowing them to make a profit of maybe $2.10 every 4 months off my leftovers. b. If I threw them away after I read them (in one fell swoop), anyone who takes out the garbage at our house would also have to make an appointment with the chiropractor for several back adjustments. So, in a weird way, it’s cheaper to give them to the library than to throw them away. c. There are enough individuals in our area that wear their pajamas to Wal-mart, and heck, everywhere, that surely I’m doing the community a favor by sharing my old In Style magazines. Maybe one of the pj’s-loving crowd will see that it is NOT acceptable to wear your bedclothes out in public. Well, one can hope. I’m not quite sure that I liked Gone Girl, but it was a riveting read. This book looks to be equally interesting! Honey, salt, cornmeal… all in a pie! What’s not to love? I agree… who cares about wearable tech when batteries don’t last for more than 3 seconds? These are some of the most inventive scarves I’ve ever seen!